A conceptual model of the Great Basin carbonate and alluvial aquifer system (GBCAAS) was developed by the U.S. Geological Survey (USGS) for a regional assessment of groundwater availability as part of a national water census. The study area is an expansion of a previous USGS Regional Aquifer Systems Analysis (RASA) study conducted during the 1980s and 1990s of the carbonate-rock province of the Great Basin. The geographic extent of the study area is 110,000 mi2, predominantly in eastern Nevada and western Utah, and includes 165 hydrographic areas (HAs) and 17 regional groundwater flow systems. A three-dimensional hydrogeologic framework was constructed that defines the physical geometry and rock types through which groundwater moves. The diverse sedimentary units of the GBCAAS study area are grouped into hydrogeologic units (HGUs) that are inferred to have reasonably distinct hydrologic properties due to their physical characteristics. These HGUs are commonly disrupted by large-magnitude offset thrust, strike-slip, and normal faults, and locally affected by caldera formation. The most permeable aquifer materials within the study area include Cenozoic unconsolidated sediments and volcanic rocks, along with Mesozoic and Paleozoic carbonate rocks. The framework was built by extracting and combining information from digital elevation models, geologic maps, cross sections, drill hole logs, existing hydrogeologic frameworks, and geophysical data. Most groundwater flow occurs at local and intermediate scales within each HA, but previous studies have suggested interbasin flow on the basis of groundwater budget imbalances, isotopic studies, and numerical modeling. A regional potentiometric-surface map of the GBCAAS study area was developed based on water-level data from wells, springs, and perennial mountain streams. This map indicates that groundwater levels and hydraulic gradients within each HA generally follow topography and flow from areas of high land-surface altitude to areas of lower altitude. At the regional scale, groundwater flow between HAs may occur where (1) a hydraulic gradient exists, (2) the intervening mountains are comprised of rocks permeable enough to permit groundwater flow, and (3) substantial groundwater mounding from mountain-block recharge does not occur. The potentiometric-surface map indicates general groundwater movement from mountainous areas to the Great Salt Lake Desert, the Humboldt River, the Colorado River, and Death Valley. Hydrologic data from previous investigations were compiled and reinterpreted to quantify groundwater recharge- and discharge-budget components. The Basin Characterization Model (BCM), a distributed-parameter water-balance-accounting model, was used to estimate recharge from precipitation. Prior to groundwater development beginning largely in the 1940s, total recharge was estimated to be 4,500,000 acre-feet per year(acre-ft/yr) with an uncertainty of ± 50 percent (± 2,200,000 acre-ft/yr). The primary source of groundwater recharge to the GBCAAS is direct infiltration of precipitation. The estimated average 1940–2006 in-place recharge from precipitation is 2,900,000 acre-ft/yr. Other forms of recharge include infiltration of surface-water runoff including irrigation return flow (570,000 acre-ft/yr), recharge from mountain streams (130,000 acre-ft/yr), recharge from imported surface water (990,000 acre-ft/yr), and subsurface inflow (not estimated). Prior to groundwater development, total groundwater discharge was estimated to be 4,200,000 acre-ft/yr with an uncertainty of ± 30 percent (± 1,300,000 acre-ft/yr). The two major components of discharge are evapotranspiration and springs. Estimated groundwater discharge to evapotranspiration and springs for predevelopment conditions was 1,800,000 acre-ft/yr and 990,000 acre-ft/yr, respectively. Other forms of discharge include discharge to basin-fill streams/lakes/reservoirs (660,000 acre-ft/yr), discharge to mountain streams (450,000 acre-ft/yr), and subsurface outflow (not estimated). Some previously reported estimates of discharge to evapotranspiration and springs were made while groundwater withdrawals were occurring; an additional 330,000 acre-ft/yr adjustment to natural discharge for well withdrawals was estimated for the predevelopment groundwater budget. Between 1940 and 2006, groundwater development occurred in various parts of the GBCAAS, with estimated total well withdrawals increasing from less than 300,000 acre-ft/yr in 1940 to almost 1,300,000 acre-ft/yr in the late 1970s. Since the late 1970s, well withdrawals have fluctuated between about 1,100,000 and 1,500,000 acre-ft/yr. Although well withdrawals have been minimal in the majority of HAs and groundwater flow systems, some areas have undergone substantial development, sometimes causing significant water-level declines. Although the majority of well withdrawals are used for irrigation, there has been a general increase in withdrawals for public supply and a decrease in withdrawals for agriculture since the late 1970s. In addition to the estimated predevelopment groundwater recharge of 4,500,000 acre-ft/yr, the recent (year 2000) groundwater budget for the GBCAAS study area also includes recharge from unconsumed irrigation and public supply water from well withdrawals (470,000 acre-ft). The estimated decrease in combined natural discharge and groundwater storage within the GBCAAS study area caused by well withdrawals for the year 2000 was 990,000 acre-ft, including a minimum decrease of 67,000 acre-ft in groundwater storage. Please note: In order to make the bookmarks for the combined report function properly, download the zipped directory named "downloads.zip" and place the combined report file on the same level as "PDFfiles" and "Includes". "downloads.zip" directory contains "PDFfiles" with Plate 1 and Plate 2, six auxiliary files and table A8-1 as Microsoft Excel files, inside a directory called "Includes". Please note: In order to make the links to the combined report function properly, download the zipped directory named "downloads". These are individual electronic versions of the four chapters, eight appendixes, and two plates in SIR 2010-5193. Please note: In order to make the bookmarks to other chapters function properly, download all files and place in a directory named "PDFfiles". 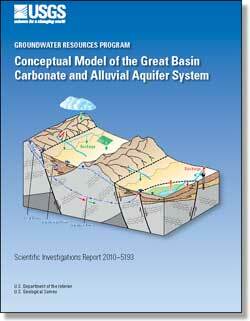 Heilweil, V.M., and Brooks, L.E., eds., 2011, Conceptual model of the Great Basin carbonate and alluvial aquifer system: U.S. Geological Survey Scientific Investigations Report 2010-5193, 191 p.